The Victoria was a primitive index typewriter that was produced in Germany, for the French market. In Germany, the machine was sold as the Famos. The operation of the machine was simple. The index held 84 characters in alphabetical order. By turning the knob on the back of the circular index, the letter was brought into position. Pressing the button on the side, brought the index wheel down onto the paper. Inking by two rollers. The peculiar bit was that the paper was fixed around the platen and the platen had to be turned one space to print the next letter. To write a next line, the entire index would be moved one step along the length of the platen. 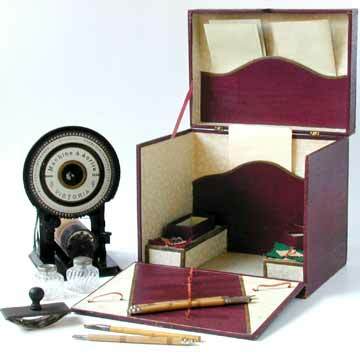 The Victoria presented here came in a miniature office box with special stationary. In 1913 the German producer of the machine replaced the Famos with the Aktiv, another cheap index machine that was mostly sold through toy shops, although it was intended for the serious typewriter market.